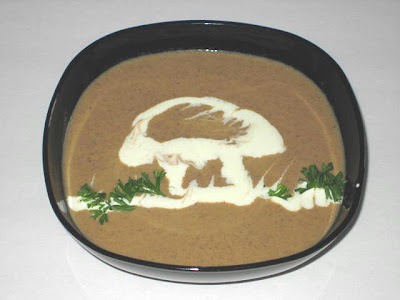 This is excellent way to serve leftover mushroom soup. Actually, it is so good that it is well worth it to make it from scratch. Since I have already posted recipe for mushroom soup I’ll just describe process of turning it into a cream. If you are using leftover soup, warm it up in a deeper pot for easier no-mess blending. 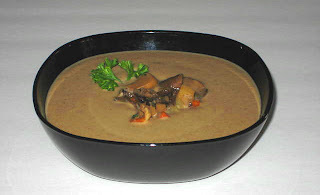 If you prefer cream of mushroom soup with some texture remove with slotted spoon (wider the slots the better) as much solids as you like and keep warm for serving. 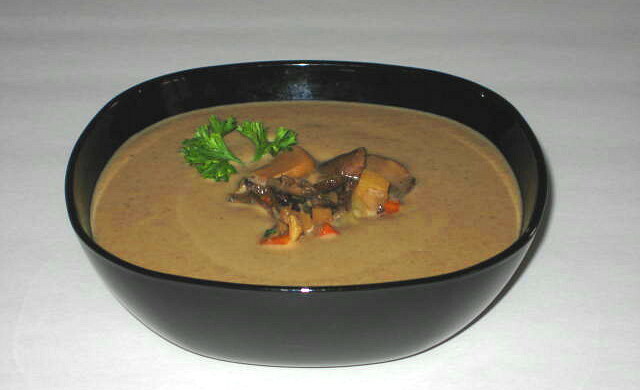 With immersion blender liquefy the soup for minute or two. Add cream, again as much as you like but no more then 1:4 ratio of cream/soup. Liquefy for another few minutes till smooth. Return to heat and when warm, serve in preheated bowl. Creamed soups are great with addition of little bit of curry. I use Malaysian (seafood) curry that is perfect match for these soups.